My first solo backpacking trip was hastily planned and threatened by a forbidding, thunderstormy forecast. Despite this, it was a huge success. 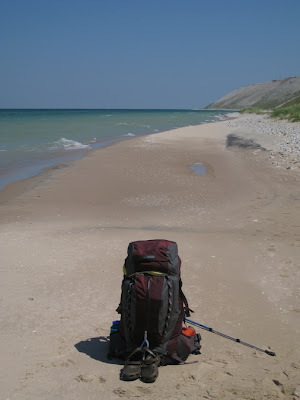 My destination was South Manitou Island, one of two islands within Sleeping Bear Dunes National Lakeshore. Chippewa legend says that long ago, a great fire broke out in the land that is now Wisconsin. Animals fled the forest, and a mother bear and her two cubs sought refuge in Lake Michigan. They swam for days to reach the opposite shore, but the two cubs became weak and fell behind. When mother bear reached the Michigan shore, she climbed to the top of a tall bluff to watch for her cubs. Sadly, they did not make it, and in remembrance, a great spirit created North and South Manitou Islands in the place where they were last seen. 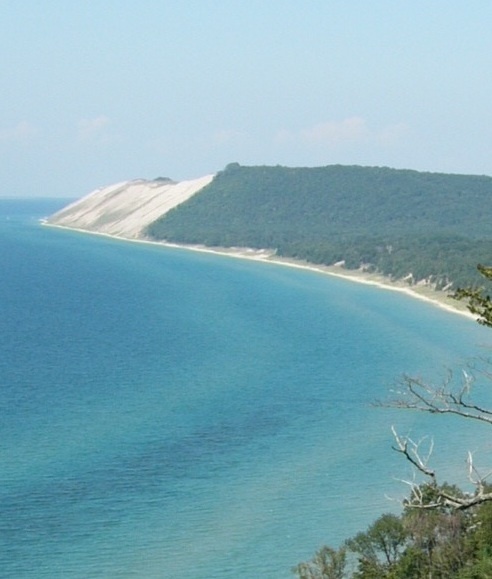 Sleeping Bear – a tree-covered hump at the top of the most picturesque of the mainland lakeshore's sand dunes – is said to be the mother bear, still watching and waiting for her cubs to this day. 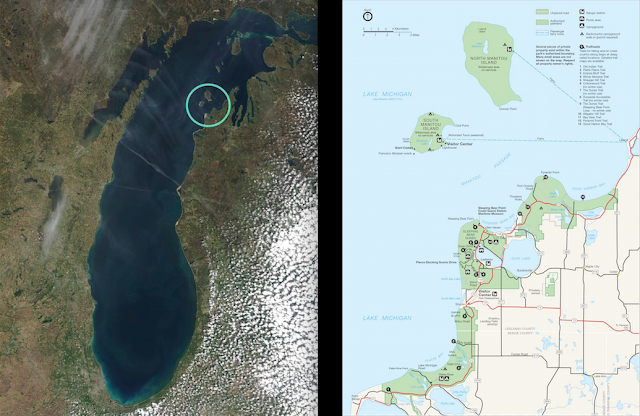 The Manitou Islands are reached via passenger ferry from Leland, a small resort town just north of the national lakeshore. The 7-mile, 90-minute voyage departs from Leland's historic Fishtown, the center of a former commercial fishing village. 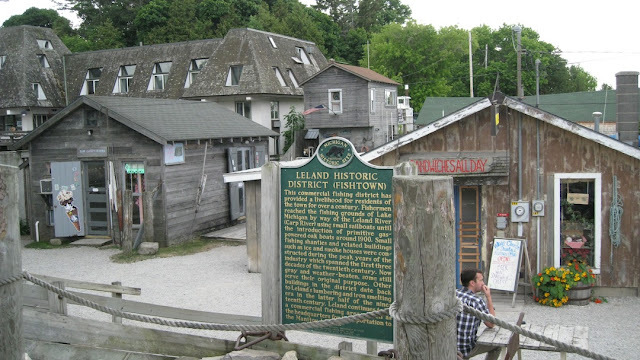 Currently owned by the Fishtown Preservation Society, Fishtown is a cluster of old but maintained fishing shanties, which line the banks of the Leland river near its mouth. These days, fishing tugs still operate here and fish can be purchased, but most of the shanties have been converted to shops selling artwork, jewelry, and other gifts, much of which is locally-made. 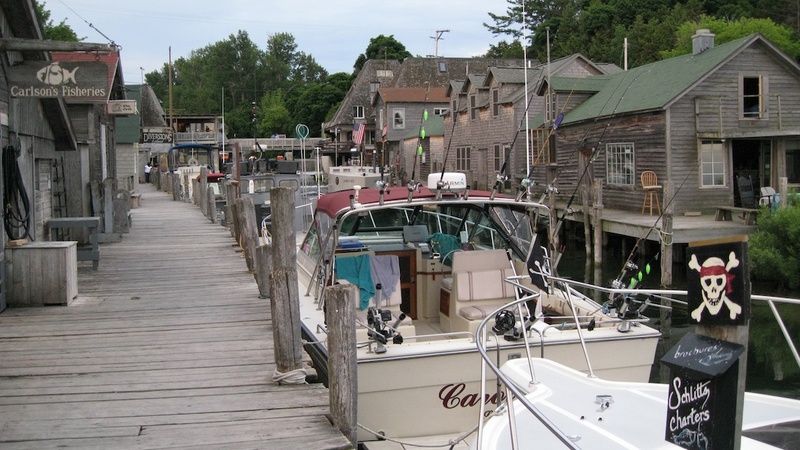 There is also a candy store, a cheese and sandwich shop, and a small motel located right on the water. 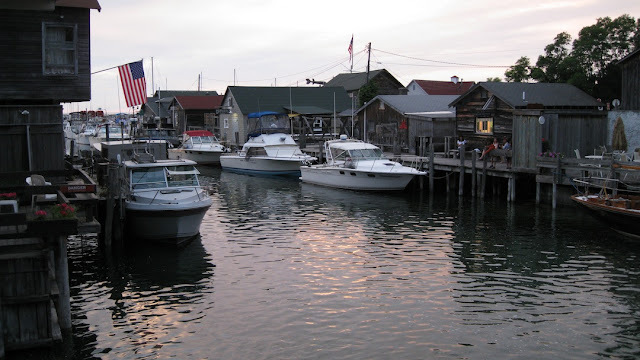 Directly north of the Fishtown district, Leland Yacht Harbor hosts a variety of boats for those spending their summer vacations on the lake. The ferry was scheduled to leave at 10 am Saturday, so I made arrangements to spend the night in Fishtown. Despite its summer touristy-ness, Fishtown was a fun place to spend the afternoon and evening. I visited all of the shops, enjoyed a sandwich and Bell's Two-Hearted Ale at Village Cheese Shanty, and watched otters playing in the water just upstream from the river mouth. The docks lining both banks of the river act like a boardwalk, and people dropped lines in the water and caught fish right from the docks. I ventured out of Fishtown and along M-22 to check out various shops in Leland, then returned for a couple of glasses of local Pinot Grigio at The Cove, a restaurant directly across the river from Falling Waters Lodge. The weather forecast had improved over the week, and I was looking forward to reaching the island the following day and hiking for the first time since September. I was slightly nervous and my pack was ridiculously heavy for such a short trip. Having only three days, South Manitou Island is an ideal destination. Instead of exploring the island's interior trails from a base camp, my plan was to hike the perimeter of the island via the beach. At 12 miles, this could be accomplished in one day, but I intended this trip to be part solo adventure / part summer beach vacation, so I planned to use all three days and to enjoy the short vacation as much as possible. Very cool -- I'm looking forward to the rest! I had never thought about hiking those islands before. Thanks for the great blog! Your writing and photos are much appreciated. I agree ...so very interesting ...makes us want to hike it and see what it is like to do so before we go. Gives an idea of what to expect. Love it. B.